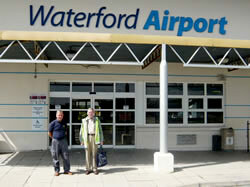 Alouette Flying Club - Report - Waterford - or bust! This was the trip that seemed destined never to happen, we had tried various times to get there and each time had been thwarted by the weather in one way or another. One trip ended on the Isle of Wight and as someone pointed out, that's some navigational error! The day before the planned flight, three pairs of eyes were scanning the TAFs to see what we might expect for the next day and it was beginning to look like this time it might just happen. So we agreed to meet up at Biggin the next morning and asses the situation as these things have a habit of changing, often for the worse. Our route out was to be to Kemble, Swansea and Waterford, giving three legs of similar proportions and that meant we would all get a flight. But on the morning the wind at Kemble was distinctly cross and gusting so Pete, the pilot for the first leg, wasn't happy. Also, the weather at Biggin wasn't the best so we decided to busy ourselves loading the aircraft and getting the fuel topped up. Once this was completed a quick check revealed the news we had hoped for, the wind had swung round and was almost up the runway at Kemble, plus the cloud at Biggin had lifted a bit more so it was time to go. Departing 21 at Biggin we could see that the cloud base was a little lower than we would have liked but we hoped as we went West, that would improve. It didn't. Routing via Farborough, we helped them out by reducing our height and carrying out a short orbit in order to keep out of the way of traffic inbound to them, then resumed our navigation around the Heathrow zone, past Blackbushe, Reading and over the White Horse at Uffington. But the cloud was still low, and getting darker, had we made a mistake in being optimistic about our chances of making it to Ireland? As we navigated between the Brize and Lyneham zones we could see some brighter weather ahead and then, all of a sudden, the cloud had gone and was behind us revealing a much better sky ahead. With Kemble on the nose, we made our way into the circuit and landed. Leg one complete. But we had been here before on a previous attempt and still didn't complete the trip so the next thing to do was to check the weather again. The helpful staff at Kemble assisted us in finding out what was going on ahead at Cardiff, and then Swansea. It looked good, not perfect but acceptable so after a quick lunch, Trevor took the controls for our next leg over the hills of South Wales. Routing over the old Severn Bridge we spoke to Cardiff who were a bit busy so we kept to the north of their zone and headed for Swansea. The cloud base was a little low but could have been worse and we were able to maintain our planned height without dodging any clouds. Swansea gave as a straight in to runway 28 so we taxied to the Tower to pay our landing fees and file the all-important flight plan for the next leg to Waterford. 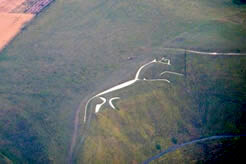 We could have done this earlier but due to the weather and the uncertainty over timings, we decided to do it here. 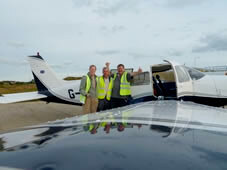 Trevor and Pete topped up the fuel whilst I filed the flight plan and we were soon on our way for the final leg to Waterford. As we went over Carmarthen, we hit some more low cloud and wondered what we would find when we got to the coast at Strumble Head. We needn't have worried, the sea and sky were perfect and yours truly settled down to an enjoyable crossing in the best weather so far. A perfect evening for flying......lucky beggar! London Information were their usual helpful selves and gave us a squawk code for Shannon long before we got to the FIR boundary. Shannon took over and continued the service until we were about 20 miles from Waterford. A bit of confusion, over a local VRP which wasn't on our map, was soon sorted and we were cleared into the zone to land. 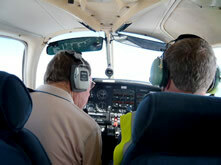 Formalities completed, we locked up the aircraft and headed into town for a beer, or three. But the next day the weather forecast left us with a problem. We had planned to stay two nights and come back after that but the forecast wasn't good, in fact it left us with a catch 22 situation. 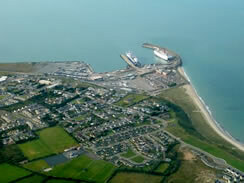 The weather over Wales wasn't encouraging for our return but Waterford looked good. However if we waited for the Welsh weather to improve by staying an extra day, the Waterford forecast looked distinctly discouraging. So, reluctantly, we decided to come back early. So our leisure day turned into another aviation packed adventure. Routes were planned to take account of the weather ahead, phone calls made and the flight plan filed. The aircraft was topped up with fuel and in the end we didn't leave until 2.20 local which meant we wouldn't have time to get to Wellesbourne, our original destination. So we decided to take it one step at a time as we weren't sure what the weather ahead would be like when we got there. The first leg took us to West Wales (Aberporth) where we closed our flight plan and changed pilots. After a quick look at the map and a few phone calls, we decided Shobdon would be our next stop as we knew it would be open whereas Wellesbourne being that much further, wouldn't be. The weather was just perfect and the views over the hills of South Wales fantastic. On the ground at Shobdon we had to decide whether to stay the night or carry on to Biggin. It was a lovely evening and we were tempted to stay but another check on the weather from this point forward convinced us it had to be tonight so after a short planning session, we set off for our final leg. The route back took us past Gloucester, keeping well clear of their airspace, then past Kemble, through the Brize-Lyneham gap and back to Reading and Farnborough. As we neared Biggin the weather didn't look quite so good and that sunny evening back at Shobdon seemed like a long time ago - in fact it was only an hour and a half. 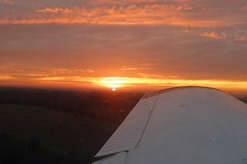 Biggin gave us a left base join for 03 and by this time the runway lights were on as sunset was only a few minutes away. No need to use that night rating this time though. Landing on 03 we noted that the runway was wet and that there had obviously been a heavy shower earlier. As we taxied back to the club house, the setting sun broke through under the cloud and gave us a magnificent sunset to finish off the trip. Perfect!